The western painted turtle (Chrysemys picta bellii) is one of four recognized subspecies of painted turtle in North America. These subspecies are delineated based on the geographic separation of different species populations. All subspecies populations are secure and not at risk of extinction, and the species is not the subject of any conservation actions. The International Union for Conservation of Nature and Natural Resources considers the species as a whole to be of "least concern." People consider painted turtles some of the most attractive turtles, making them popular in the pet trade. 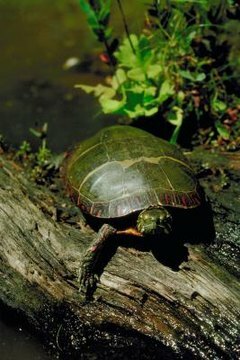 Their smooth dark upper shells are accented with bold red or yellow borders, and they have bright red or yellow stripes on their legs, tails and necks. Of the four subspecies, western painted turtles are the largest, growing to between 4 and 10 inches long. Western painted turtles also boast the most intricate colored patterns of any of the subspecies. Painted turtles are the only species in North America that live across the entire continent. These widespread and abundant reptiles even make their homes in parts of Mexico and Canada. Western painted turtles in particular live near the Pacific Coast and east through the Upper Missouri Basin. They're found as far north as Ontario, Canada and as far south as Mexico. They prefer shallow, slow-moving ponds or streams with soft bottoms and dense vegetation, but they're also found in swamps and brackish water -- even in drainage ditches. They're hardy turtles and tolerant of pollution compared to some other reptile species. Like all reptiles, western painted turtles are cold-blooded, which means they rely on their outside environment to help regulate their body temperature. These day-active turtles spend hours basking in the sun, warming their bodies to increase their metabolism and fight off infections. Because they're so abundant, it's common for several turtles to share the best basking spots -- as many as 50 might be sunning on a single log. If it gets too crowded, they even lie on top of each other with smaller turtles resting on the shells of larger ones. If you want to see western painted turtles in the wild, the best opportunities come in the warmest part of spring and fall days, or on early summer mornings. The turtles come out to bask most frequently at these times. However, it's important not to disturb the turtles or remove them from their natural habitats. Not only do turtles carry diseases such as salmonella that can be dangerous to people, but the turtles are a vital part of the ecosystem where they live. Western painted turtles help keep ponds clear of algae and vegetation overgrowth. These turtles also are protected by law in many states, even though they're not considered threatened or endangered.